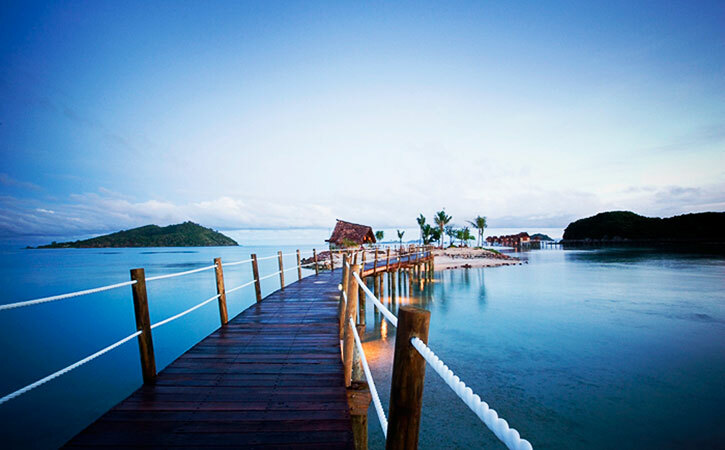 This haven of subtle luxury is one of Fiji’s only resorts with over-the-water bungalows. An idyllic romantic resort for couples only, this magical sanctuary offers the ultimate in privacy and relaxation while embodying the richness and warmth of the Fijian culture. Located on Malolo Island in the Mamanuca Group, Likiliku offers over-water bungalows as well as beachfront bures – some with private plunge pools. All bures have air conditioning, ceiling fans, telephone, King-size bed, indoor & outdoor showers, spacious deck, music system, WiFi, mini-bar on request, tea/coffee making facilities, refrigerator, complimentary Fiji Water and fresh baked cookies and ice daily, iron & board, hairdryer, in-room safe, bath robes, beach towels, lounge area, Pure Fiji His & Her amenities, Likuliku Lei, complimentary Likuliku Sulu (sarong), evening turn-down service. Beach Bures - Only a few steps from the beach and crystal clear Lagoon, the combination of Garden Beachfront and Beachfront Bures feature an outdoor daybed retreat, private courtyard and outdoor shower, spacious deck and beautiful interiors. Deluxe Beachfront Bure - Feature secluded rear courtyard, outdoor shower, spacious deck, outdoor daybed retreat and personal plunge pool. Over-Water Bures – Fiji’s only over-water bures feature a deck, separate bathing pavilion with bathtub, flat-screen TVs and DVD player, a daily Chef's Canape Plate and a King bed. including two internet desks adjacent to Reception. The Dive shop at LikiLiku is operated by Subsurface Fiji who are a professional dive company, a PADI 5 IDC Instructor Development Centre and a member of the Fiji Dive Operators Association. Subsurface caters for all ages, novice divers, adventurous and experienced divers. 5x modern dive boats, 3x9 metres, one 8 metres and the other 7 metres and all capable of speeds in excess of 30 knots allows only Subsurface divers access to the best dive sites in the area. 180 tanks, Seaquest, Aqualung & Sherwood rental equipment, nine PADI instructors and six PADI Divemasters make the professional team. Nitrox is also available. LikiLiku is near the Malolo barrier reef. The accessibility to the dive sites makes diving with Subsurface an ideal diving holiday. The wide variety of coral environments which they dive, are all between 2 - 30 minutes from our dive shops. Subsurface offers drift dives, night dives, wreck dives and more. Subsurface also offers dive sites suitable for children and novice divers. Subsurface offers you ecofriendly dive practices and the ability of catering to groups. With their fast custom built dive boats you will have access to a wide range of dives ites in the Mamanuca group of islands. Generally, there are two very distinctive marine environments. One is a huge lagoon many thousands of acres in area. The other is found at the Barrier Reef and its passages. Click on some of our divesites below for more information, but be sure to look at the Supermarket and Namotu divesites. B26 Bomber: This American Bomber aeroplane crash landed only 1 1/2 kilometres from Beachcomber Island in 26 metres of water. Although the aeroplane is well broken up and strewn across the bottom of the ocean, most parts are still all there. We have connected them by a rope so they are easy to find. Entire wing sections, both engines, tail section, electronics, ammunition, the undercarriage, and in fact, the entire aircraft is on the seabed. Although there are no skeletons to be seen, we understand that all the crew were killed on impact. Salamanda Shipwreck: The salamanda is a decommissioned, 40 metre cruise ship that we sank in 30 metres of water. Diving on a shipwreck is always an exciting dive. The vessel is now covered in soft corals and anemones. Shrimps and crabs in some of these anemones have produced a number of prize winning photographs. Jackie’s Reef: For 35 years the resort has been fish feeding here from coral viewing boats and this has bought about a fish population of great diversity and abundance. Both large and small reef fish, both solo and in huge schools, allow a rare opportunity to see all these fish at one shallow, easy and close dive site. Vomo Island: We have two separate dive sites here; Ronnies Reef (named after a famous New Zealand diver) never fails to please even the most discerning of scuba divers. Dramatic canyons and gullies along with great fish life, unusual and spectacular coral formations will be found here. The other site, known as Vomo Caves, consists of caverns and swim-throughs with shafting light breaking through crevices in the reef above makes this dive a very memorable experience. Tui's Reef: An easy dive in 18 metres of water or less on a series of pinnacles close to Beachcomber Island. Often used for night diving where divers frequently observe Crayfish, Clams, Moray Eels and a multitude of other tropical marine life. Stonehenge: This dive site is frequently used by Subsurface for training purposes. It's a series of pinnacles rising to within 5 metres of the surface. This dive is absolutely ideal for training divers because of its shallow depth and the inside arena that these pinnacles create. Bird Rock: A dramatic sheer wall plunging in excess of 40 metres. This site is known for its swim-throughs and caves, soft corals and plentiful fish action. The Circus: Superb hard corals adorn these 7 bommies. Acropora, Staghoms, giant plates in a kaleidoscope of colour. Coral Gardens: A shallow reef dive with a mind-boggling variety of different corals and reef. The Pinnacles: This site is made up of three deep water pinnacles with swim- throughs, lots of large roaming fish, like Grey Reef Sharks, Barracuda, while the top is covered in a clown fish garden. Sunflower Reef: A shallow coral reef with rainbow soft corals, cabbage corals, moray eels and an incredible abundance of fish life. Call us at 800/541-4334 (Toll Free) or at 650/728-7076 (Direct) or email us at info@aquatrek.com for a customized quote or for our latest Specials!